For customers that want control and security of their email server software. MDaemon (pronounced M-Day-mon) is one of the most widely used Email Servers in the world, trusted by customers in over 90 countries to meet the needs of their small to medium sized businesses. MDaemon is a reliable and secure email server that does not require expensive administration or impose high per-user costs. It simplifies messaging and collaboration requirements with an intuitive, user-friendly design offering enterprise-class features that can be managed with minimal training and support. Based on 100-user license, and publicly-available pricing as of October 2018. Pricing comparison note: MDaemon includes features at no cost (e.g., archiving, instant messaging, etc.) that may be offered by its competitors for additional cost. In such cases, those additional costs have been included to create more accurate product price comparisons. in addition to basic anti-spam and remote administration. ** Office 365 includes basic email, Office online, and Lync (video conferencing and IM). 1 Microsoft cost calculated from www.microsoft.com. Listed below are individual PDFs comparing the features in MDaemon Email Server to other currently available email server software. This information was compiled using publicly available information about each of the competitive products. 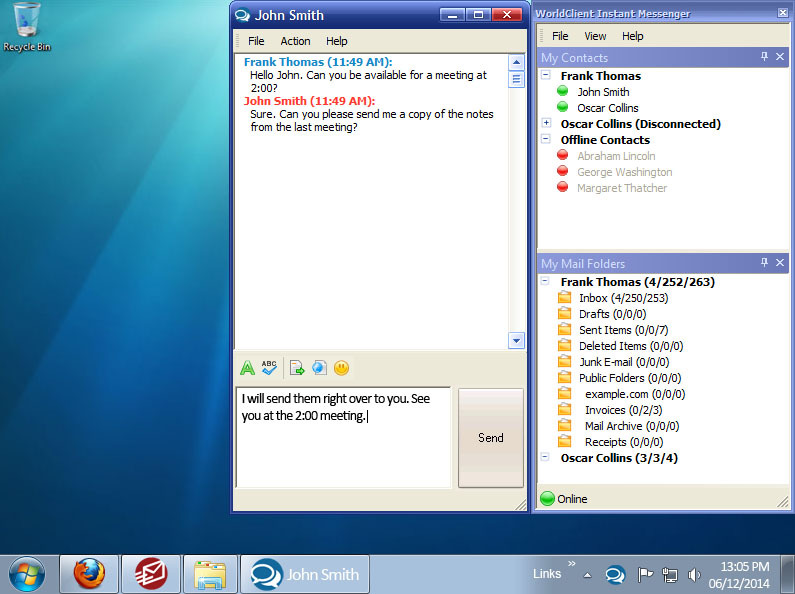 MDaemon Instant Messenger is a Closed Instant Messaging desktop client (app), included free with MDaemon, that provides highly secure Instant Messaging (IM), logging, file sharing, group chat, and an email notification tray applet to provides quick access to MDaemon Webmail's features. I spun up an MDaemon server about 11 months ago. I spent at least a year trialing it and hammering on it relentlessly. I can't think of any program (other than Veeam) that I've been more satisfied with. And cost-wise, it can't be beat. There are a few improvements I'd like to see. The email equivalent of a "packet tracer," for example, that would tell you why an email failed to be sent or received. Sometimes it can be hard to track down if you don't do it every day. I've found two minor bugs in the program that were acknowledged and will probably be fixed in future releases. But the point is that they acknowledged them and gave me a work-around that was simple. Upgrading through several minor releases and a major release went flawlessly. We've converted 100% to the webmail client - our users love it. In 10 months, MDaemon processed 1.2 million emails for us. Been installing this since the late 90's, and for the IT guy it's a breath of fresh air compared to the headaches that Exchange gives. Rarely gives trouble, and problems are mostly easy to diagnose. Much more flexible than Exchange, and will work with any standard SMTP account. Includes as standard many features that are expensive add-ons for Exchange. Settings and data are in files rather than a database, which makes for greater transparency. Easy setup, easy migration to another server. Just works, hardly ever any downtime. Really nice webmail program. Highly configurable. Does not require active directory, but can be run on a DC and use its account authentication. Has most of the collaboration features of Exchange including shared calendars, tasks, notes, etc. Some clients use the webmail server as their main email platform, in which case everything is on the server, all that's needed on the client is a browser. The file based storage means that large mailbox access does get a mite slow on mechanical disks. No problem with a couple of enterprise grade SSDs though. Integration with Outlook is less complete than with Exchange, and won't always satisfy the Microsoft-worshippers who expect all of the more obscure features to be there. We currently use this for our email. I find it pretty easy to use, and they have great support, both by phone and via spiceworks! I've been using MDaemon since 1997. Rock solid and super secure. Really nice and easy to admin product. Useful in any IT environment it can really help people to do more with less. Content Filter is my favourite feature. Ran MDaemon for 10 years went through several upgrades. Is a really nice email server for the company who thinks they are too small for Microsoft Exchange. I has some of the same features but not as robust. MDaemon is a strong software for smaller environments. I had roughly 100 accounts setup and used the Antivirus plug in, also they worked well. 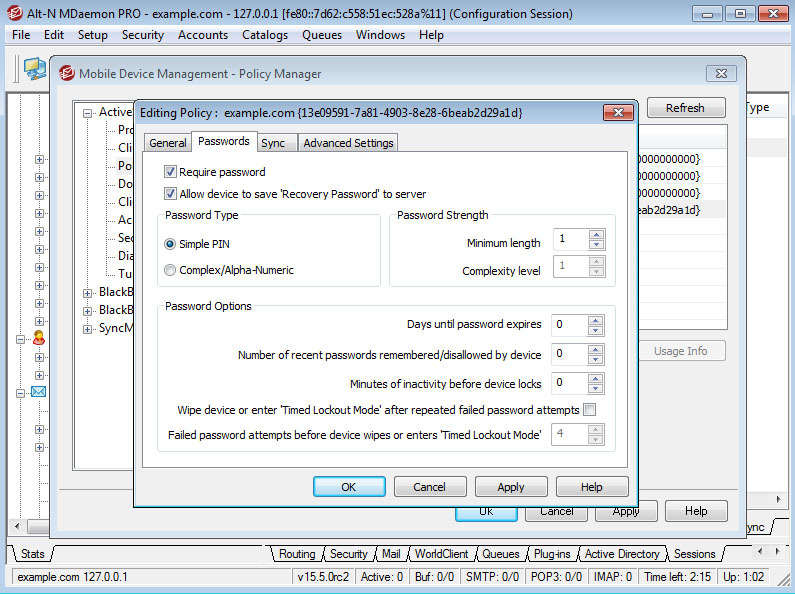 We've been using MDaemon Pro for one year which has been a complete success. We are about to upgrade to the latest version at this time v14. MDaemon's support has been great the few times we needed it, they were always willing to assist with a cheerful attitude. MDaemon has also implemented multiple suggestions we have made to the MDeamon software. Our employees have been starting to take advantage of the instant messenger, shared folder/calendars that is built into MDaemon. I've been taking advantage of the simplicity of the administration side of the software. I'm looking forward to the future with MDaemon. MDaemon is an excellent product. We've been installing this at clients for many years. Either as a standalone Email server, or as a SPAM filtering solution to Microsoft Exchange. Backing up and restoring is a breeze. I love it! READ THIS IF YOU ARE CONSIDERING MDAEMON. This may not pertain to you or it may save you some wasted time/money. Mdaemon is great as a basic mail server. It is reliable, has a lot of great options and features and is very intuitive. The tech support is leaps and bounds over other tech support I have used. It seems like every tech support guy knows just about everything about the system. We have 1150 users and are very happy with the overall system. There is only ONE BAD THING I have to say about it, but it is really a HUGE thing. 1) If I am in list 1 and list 2 I will get 2 emails, one for each list. A minor annoyance but still annoying nonetheless, especially for already confused end users. 2) If I try to reply all to one of the lists I will only be sending an email to one list, because the other list is in the other email that I received! The emails are processed separately, one at a time. 3) I will never know that an email has been sent to anyone in list 3 because I am not in list 3 and did not receive a duplicate email for that list! And if the people in list 3 are not in lists 1 and 2 they will never know that those lists received the email either! So if you have different departments with their own email lists and need to communicate with select lists at a time forget about it, it's not happening. Thus, the docking of 2 stars because communication is sort of the purpose of an email system and this flaw BREAKS DOWN communication between email lists. EVERY OTHER MAIL SYSTEM does not behave this way. You only get one email even if you are in multiple email lists and you can reply to all. I have also spoken to the truly wonderful (not being sarcastic) support on this issue many times. They know the inside and out of their system. And the word is "That is how the system was designed." These guys are awesome. If you are looking for low cost, easy to manage on premise email - especially in the SMB with Windows admins, this is where you want to start. We have several installations some even as far back as 2000, It just works, intuitive, simple and very easy to trouble shoot and just keeps on working. I've used mDaemon for over 13 years and have never had an issue with it. Pricing is reasonable and support is truly excellent, plus updates packed with new features and improvements are released regularly. Well done guys, keep up the great work. one of the charity company i worked before used it since their inception. The IT admin loved it for its reliability. I've been working with MDaemon for 8 years and, while the core product has remained as good as it always was, the rest of it has changed hugely. I am a 'one man band' looking after the IT for a number of small businesses and have recommended and installed MDaemon servers into 4 of them. MDaemon provides a solid, standards-based email server, plus Calendar, Contact and message sharing within Outlook, plus an excellent (and constantly evolving) web mail interface, plus BlackBerry (BES & BIS) and ActiveSync connectivity, plus email anti-virus, plus mailing lists. One of my clients uses a mixture of BlackBerry, Apple & Android handheld devices, all synchronising to MDaemon accounts with Outlook Connector synchronising on the desktop. All for (roughly) a quarter of the price of Microsoft Exchange server. My only disappointment is that I can't get Outlook Connector for the Mac. If you've looked at MDaemon in the past and discounted it for whatever reason, can I urge you to give it another look? Prior to my current job, I owned a consulting business working with smaller companies on their IT needs. Whenever email came up, MDaemon was always the first thing I suggested to my clients. It was easy to setup, easy to maintain, and even easier to monitor. At one point in time, I was managing 14 companies emails using MDaemon and it ran smoothly at all 14 locations. Tech Support for this product is second to none. Problems were easily found on their Knowledge Base system for Partners and if the problem wasn't located there, the tech support staff would be able to get you up and running in no time at all. I can't say enough great things about this product and I highly recommend this to any company who's needs might be to get basic email all the way up to using Outlook Connector and connecting with your iPhone or Blackberry. This product continues to improve with every new release. Two thumbs up for this! We have been using MDaemon since version 2.7. We use it not as our primary mail server, but as the gateway or border server. Initially we went with MDaemon because it was the only windows based mail server that could handle the number of domain names the company has effortlessly. By using the Gateway Domain features, we are able to provide a stable platform to handle 218 domain names, verify the receiver exists in the company, trim off 30k of spam mail a week, and be the first line of defense against the unfiltered Internet. The install and setup of the system is so very easy, and the detail in the logging is fantastic! Anytime there is a mail delivery issue, I am able to go through the logs in seconds and find the issue, and while I can't always fix the issue since 99% of the time it is on the sender's/receiver's side, I am able to show the exact issue to the person so that their I.T. staff is able to fix it quickly. The only negative thing I can say about it is that there is no good log reporting tool for MDaemon. I would love to be able to take the logs into a database, and generate reports on how many connections were refused and why, have a way to generate a warning if we are getting deliveries refused to existing users, etc. Internally we have gone from CC Mail, to Lotus Notes, to Exchange, but MDaemon has always been at the gateway easing the transition, and protecting these systems from themselves. When switching jobs, I inherited an Mdaemon install. Prior to that I had been running Exchange for various companies, and I hope I never go back! I don't miss corrupt PST files, and the overhead of Exchange. There is a slight learning curve, but nothing like Exchange, and Mdaemon just works... practically all the time, rarely crashes. We particularly like the mailing list features for our sales dept., they can manage their own lists through web admin, a real plus. I have since moved on from the original job using Mdaemon, but when it was time to upgrade the mail server at my current company, Mdaemon was my first choice. Running MDaemon since 1998. We switched it off during a 2/3 years period to use Lotus Domino, but it was a pain and I finally convinced my manager to come back to MDaemon again. It has been running since then 24/7. I've never been so happy. Since 2011 It runs inside a VMware VM, without any problem. - It has all the features, and more, you will ever need in an email server. - Management is fantastically easy. - Great support, big community of users, constant updates. I disagree with the opinion of some of my colleagues here who say it is a product for basic email, maybe my company is small (150 people) but has all the mailing needs of any large company, MDaemon has never failed me. The mail server is great if all you want is a basic email server. When it gets to syncing contacts and calendard they use an outlook connector (does not work with 64 bit outlook or Outlook 2013) and activesync (an older version which Outlook 2013 does not support). The outlook connector itself has some issues with syncing email, its just slow and hangs up, I actually compared this side by side with the same mailbox using imap vs outlook connector. Imap is twice as fast. These issues and lack of advancement in the activesync and outlook connector is a huge hinder. Overall a good contender for a simple email server, but not as an Exchange alternative. Great mail server but administration can be a bear if you are not familiar with the software. I am familiar with Microsoft Exchange and walking into an environment with MDaemon was a bit challenging. We used a previous version of MDaemon. I have to say that it was the bomb when trying to troubleshoot delivery errors. The logs were straight forward and fairly easy to read. When our "fearless leader" had to have Exchange, it was a complete mess trying to look at trace logs to figure out why email was getting rejected, or to verify that the mail had been delivered to the server. Moving off of MDaemon was a big mistake both in support and in the price for Exchange and the hardware to run it on. MDaemon's custom filtering is easy and intuitive. If I were to recommend a email server for any company, MDaemon would be my first choice. I'm Using MDaemon from Ver. 2.x up to now ( Ver 13.0.4 ). I decided lot of times to Move on to the Exchange, but whatever i consult to others, cause cancel the idea & so Still using MDaemon & really i & our users pleasure when working with it. By the way, one of the features can help our Users is LookOut theme that's really User friendy & help Users to work's MDaemon features as they want. 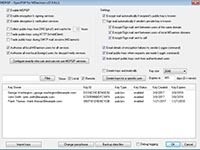 By the way, MDaemon Administration Tools & Graphs are very usefull Tools for Administrators & Don't forget Security Plus which is one of the Best Spam Blocker & give the Ability to Enjoy Users Box without Spam's e-mail. The easy Setup, Installation, Configuration & giving Services to Users in also another feature that is very hard to find in other Product's. And the last thing's that is Perfect Support ( Chat / E-mail ) in short time whenever you need Help that give you Relax & you feel a Powerfull Support allways. I Give, Rate 4.95 of 5 for MDaemon Server. I still wish I was actively using this product- I have one last mdaemon server, and it's still as stable as the day I installed it. Makes a great server, and incredibly easy to setup. mDaemon is an excellent package. One of the true measures of any system is how much downtime you have due to software glitches and all I can say is that I've had 99.8% uptime in the last 10 years of administering mDeamon. The 0.2% downtime, well that was due to hardware failures and even then recovery was a breeze with mDaemon. I agree, I used to run Exchange and trying to restore emails was virtually impossible with them hidden away in an 'access like' database file. 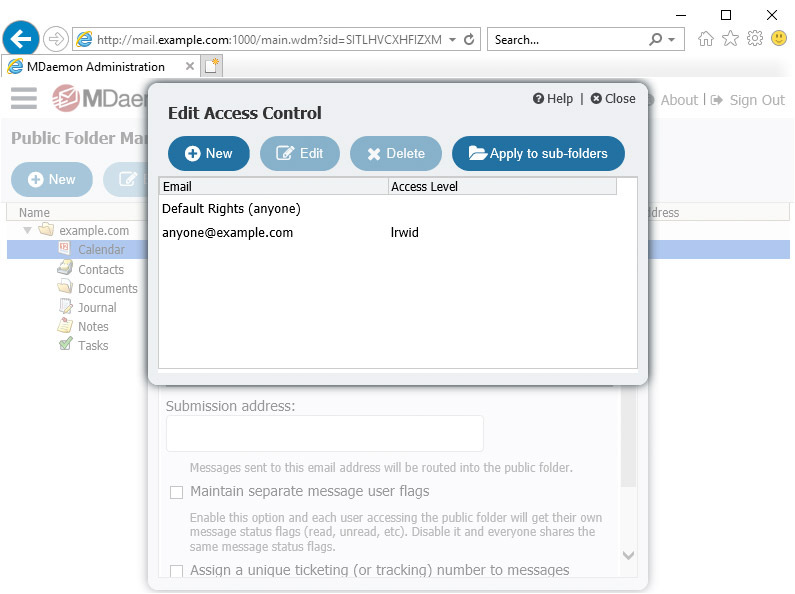 MDaemon's simple text files allow complete control of the email. Just moving a complete folder of emails from one person to another is a great timesaver. Also, the web admin interface does allow remote administration for most things, contrary to NewVillageIT - but like hin I mostly use remote desktop to get to the server 2003 machine with 2GB that it is able to support 45 users on. Just remember to defragment the disk fairly often. 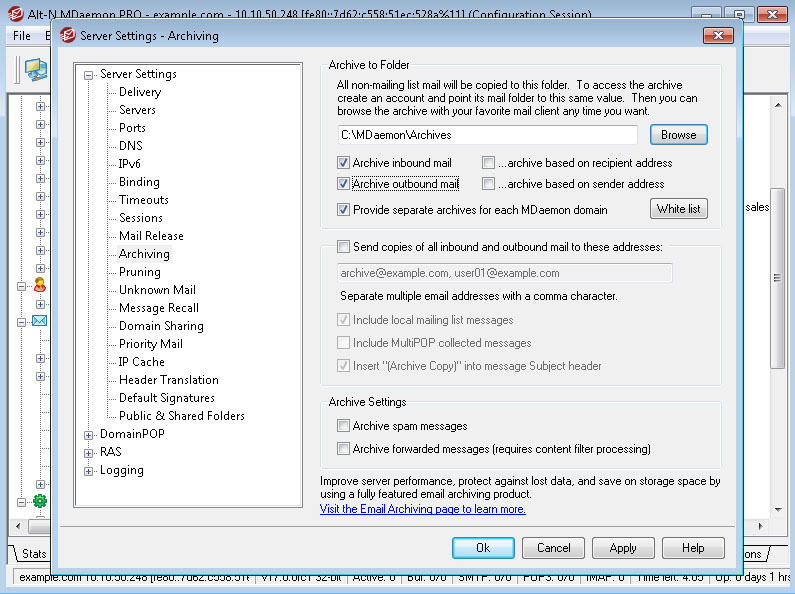 Mdaemon mail server is a great product and one I would highly recommend. After speaking to Kevin and Arron at a local Spicecorp meeting, I was able to avoid our company migrating from Mdaemon to Exchange! 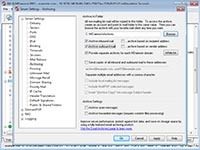 The Outlook Connector add-in feature and Active Sync allows you to have most of the functionality of Exchange, but without the complicated management of Exchange. The administration GUI is easy to navigate and makes configuration of the server and individual accounts a cinch! I also found the support staff to be very friendly and helpful. Overall - a great mail server. We're a small office of about 50 users. - It's been running on a Windows 2000 server with 1 GB RAM for 12 years! I moved it to new hardware - guess why? - Webmail interface lets users access email via web. - Webmail auto-responder when users go "out-of-office". - Content filter feature lets you control how email is processed. - Great logging - useful when users complain about not receiving emails. - Very easy to install and upgrade. - Very easy to move to different hardware. Actually not bad at all. It does have some interface quirks, like not being able to sort by various categories or being able to press a letter to jump to the first item in a listing starting with that letter. I found the interface would switch itself off very rapidly, too, so I had to launch it and then get cracking on whatever I wanted to do pretty quickly. Still, all in all, it did the job it needed to do. I used MDaemon from v2.74 up through v10 when I changed jobs. The features of MDaemon are fantastic. I especially like the content filtering engine that we used to do a wide variety of activities including kicking off scripts when certain messages arrived from other processes that have completed on the network. The way that messages are saved in individual files make restoring individual mailboxes or even individual messages from backup a breeze. The very verbose logging also makes troubleshooting a snap. Great Lightweight email server. I am using it around 6 years. It has great features like Webmail, RemoteAdmin, AntiVirus, Mailaccessmonitor, maildetective, etc. I very much love this software because what you need to setup is just give general information to it and start...!!! We've been using it for the last 8 years and have seen great improvements. The latest version includes a blackberry server integration, so that's a plus. I would recommend for tight budgets. It won't do everything that Exchange does, but I wouldn't expect it with the price. We've used this for years. Makes email a doddle; the security gateway cleans 99% of spam before the users see it. It's a web based client that MS Outlook users find intuitive. It's fast and does the job without spending huge amounts on hardware and maintenance. UK Support from Zen Software is first rate. It saves us time and money. Regular updates and a management console that is very straight-forward. Comprehensive logs let you track when incoming email is bounced. 2. MDaemon user mailbox management is just great, I like that mailboxes are not in one big database but are in files, so that data backup/recovery is much easier to do. A great lightweight email server. 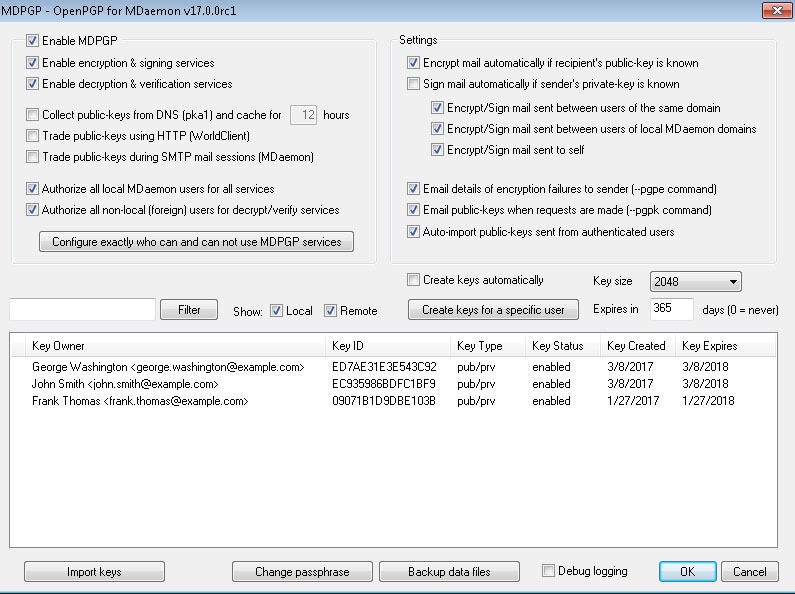 Company wanted to get into Exchange so used Mdaemon as a gateway for the Exchange server. Used the Mdaemon AV and spamfiltering already setup and just started the forwarding to Exchange. My local reseller tech support is great although limited to office hours which is the only downer. Works great, we have been using it for several years. The price is right and the boss loves the easy to understand log files. We've been using this for more than a decade and couldn't be happier. Once during that decade, we switched to Exchange - (our CEO had been talking to someone else's CEO - which should never happen) but the migraines forced us right back to MDaemon. Haven't looked back since. Very reliable and versatile email server. Also pretty cheap. Love the integration with outlook so the users keep an environment they know. I have Mdeamon running at a number of clients. It is low maintenance. Outlook Connector is reaching the limits of its capabilities as mailbox size increases - it does get somewhat sluggish. Otherwise the anti-spam & antivirus are just awesome. No agro clients with toooo much spam & no virus infections arising from e-mail traffic. Our clients compleain when they receive 2 or 3 spam messages in a period that they can remember. Mdaemon just works & continues to work. It is no easy to manage. MDaemon is a good product from a good company. I installed and maintained it for several years until we became an Exchange shop. Much easier to administer than Exchange and took a small fraction of the hardware resources Exchange demands. We just got to the point where we needed Exchange - not just a mail server. MDaemon has proved to be reliable and stable for many years now. We have it in two sites and it really does all the important Exchange type functions and several that Exchange can't do. Having tried to configure Exchange to talk to an external mail server it was a nightmare - in MDaemon it was child's play. The Outlook Connector does have some minor glitches but these do not interfere with the use of the product. The Webmail is really good in the current version and emulates OWA perfectly. The built in Anti-Spam and Anti-Virus have kept us protected and there are also several other security measures including TLS, DKIM, SPF and IP shielding to name just a few. I'd score 6 out of 5 if I could! I used for many years and never had problems with it. The only thing that does not work very good is the outlook connector. We mainly use thunderbird as our e-mail client, so outlook support is not really needed. Have used it for the last 5 years at two companies one with the Outlook Connector. Not quite an exchange killer in my opinion but significantly cheaper, The Antispam seems to work very well as does the Antivirus. If you use outlook then the outlook connector gives a much more exchange/outlook like experience. We've been using it since 1999. It's been rock solid. I've had to start mucking with Exchange 2003 in the past 2 years for a side-client, and I hate it. MDaemon does well with spam and I strongly recommend the anti-virus (Kaspersky) add-on. System was rock solid if running the latest version. Once we were no longer receiving updates the system became unstable. This happened on two different versions of MDaemon. The internal spam blocker would also discard the spam headers generated by our antispam/antivirus firewall which was running a newer version of SpamAssassin. We have been using this product for 2 years and I have had 0 problems. I have not had to down there server to defrag the store like some other name brand email platform. The only issue I would say is if there is a problem digging thru the logs is no fun. Decent mailserver app. Easy to use and setup. In 2002 when our company was looking to bring our email service in house, we looked at all the major players. We decided to evaluate MDaemon and were extremely pleased with the product. Low overhead. Never crashes. Just goes and goes and goes. 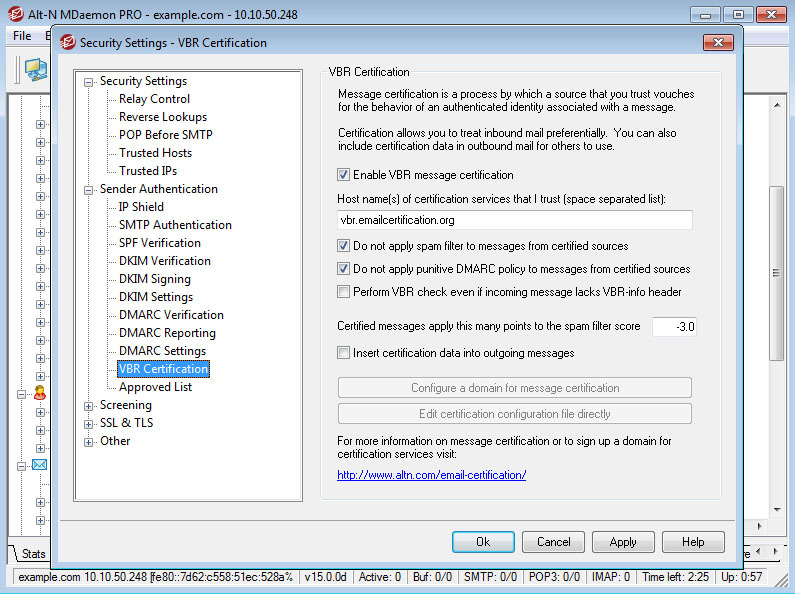 For companies concerned about product licensing, MDaemon's webmail client is packaged as part of the mail server. Webmail was packaged as part of the system years before Exchange did. The bottom line is this is one rock solid product! And has continued to get better with Blackberry integration. Complete groupware capabilities, and extremely easy to manage. There is literally no better email server for the money. Integrates with Outlook perfectly, and the webmail looks and functions just like OWA. Never has crashed unless there has been an underlying hardware issue. Good webmail interface with collaboration from the word go. 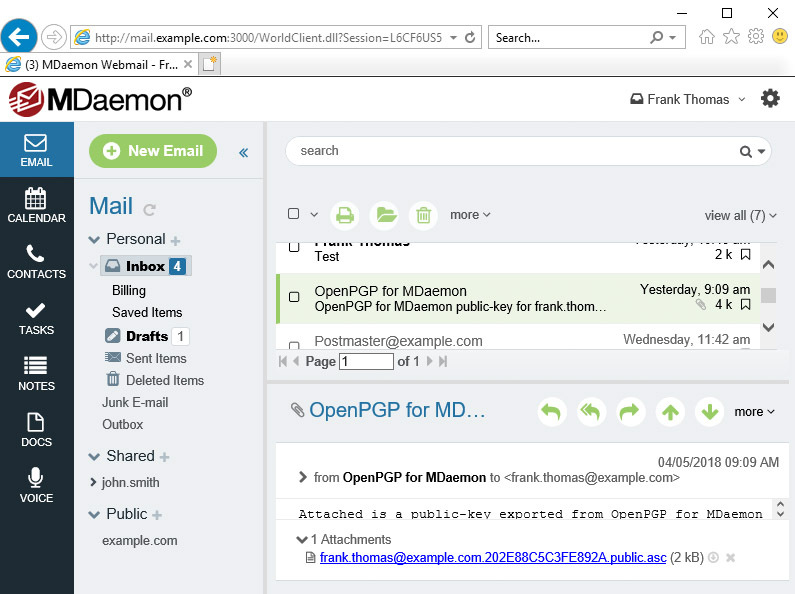 Take a look at our newest features in MDaemon Email Server. Download your free 30 day MDaemon trial today and see it in action.